To maintain beauty and aesthetics, the resort and hospitality industry spends millions of dollars per year on flooring renovation and restoration efforts. Concrete, pavers and faux finishes begin to break down and show the signs of abuse after 6-12 months. Food and beverage spills lead to surface stains and discoloration throughout high traffic areas. Regular cleaning and power washing provide temporary results while degrading the surface to expose more aggregate and make future cleaning efforts more difficult. 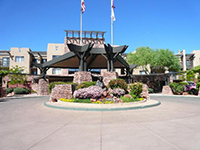 In addition to being costly, power washing and maintenance efforts are disruptive to the visitor or guest experience. Eco-CorFlex Poly Enhance Sealer is a versatile architectural flooring system that has extreme durability, chemical and UV resistance. Poly Enhance was created to protect and beautify a myriad of surfaces for interior and exterior applications. Poly Enhance can be applied clear or tinted to rejuvenate and transform worn and weathered concrete, stone and paver surfaces. To enhance visual appeal, PVA, Mica media and Liquid Art coating systems can be used to create visually stunning surfaces and custom finishes. Poly Enhance can be applied to virtually any surface or material such as concrete, paver stones and exposed aggregate. 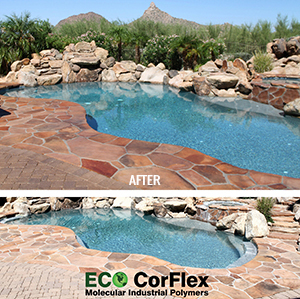 In addition to bonding to the surface, Eco-CorFlex Poly Enhance densifies and strengthens the material it is applied to. Cleanup is fast and easy using a hose and squeegee to remove dirt, food, beverage, gum, oil and anything else. Poly Enhance reduces maintenance cost while providing a means to restore and renovate flooring.